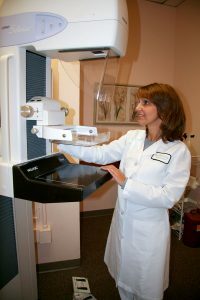 3D digital mammograms, a groundbreaking technology, take exceptionally sharp, thin section digital images of the breast at three different angles – up and down, left to right and layer-by-layer – providing our doctors with highly detailed information. The 3 dimensional image set means that it is more difficult for cancer to hide behind overlapping tissue and less chance our doctors will need a second look, meaning less x-ray exposure overall. On the day of your exam do not wear any powder or deodorant. If this is your first mammography with us, if possible, please bring your prior mammograms to the appointment. We schedule mammography exams 7 – 10 days from the first day of your menstrual cycle. Please call us the first day of your cycle and we will be happy to schedule your exam. If you have a concern or need an appointment immediately we will accommodate you. Your results will be provided on the day of your exam. Tomosynthesis is one more tool to make early detection even earlier. Watch our video to learn about how 3D Digital Mammography can help in the detection of breast cancers.